Experienced Scrabble players know there’s more to the game than an expansive vocabulary. An effective player should also be able to quickly find words in a jumble of letters. Developing this skill, reports a team of Canadian researchers, will not only improve your game, it will change the way you use your brain. In Scrabble, it’s not important to know the definition of a word, you just have to know that the word exists. This is why so many diligent Scrabble players take the time to memorize and prioritize such words as PHIZ (18 points), QUIFF (20 points), and MEZQUIT (27 points). But it’s also important to practice the art of anagramming, the ability to form a word or phrase by rearranging a sequence of letters. For example, the letters in the word LISTEN may deliver more points when placed on the Scrabble board as SILENT. Over time, this practice can have a profound effect on our ability to solve visual word recognition tasks, or what’s referred to as a lexical decision task. After becoming a Scrabble aficionado, physician Peter Sargious wondered if these abilities had a measureable effect on the brain. To find out, he and his team at the University of Calgary conducted an interesting experiment, the results of which appeared earlier this year in the science journal Cortex. His team recruited 24 volunteers, 12 of whom were non-Scrabble players, and 12 of whom were Scrabble experts. Each of them were placed in front of a computer that displayed a jumble of letters. Their task was to identify, as quickly as possible, which letters could be re-arranged to form proper English words. While this was happening, their brain states were being monitored by an fMRI scanner. So typically, for non-experts, we’re recruiting the language area of our brain. Whereas when we do the task with Scrabble experts, they’re not really using the language network like average people. They’re actually recruiting areas that are more associated with visual processing and working memory. So they’re doing the task quite differently. 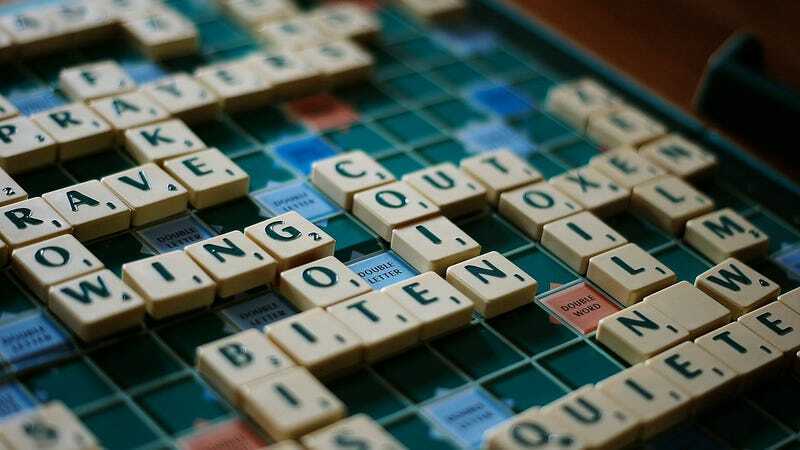 Results showed that when engaged in the lexical decision task (LDT), Scrabble experts made use of brain regions not generally associated with meaning retrieval in visual word recognition, but rather those associated with working memory and visual perception. The analysis of resting-state data also showed group differences, such that a different network of brain regions was associated with higher levels of Scrabble-related skill in experts than in controls [i.e. non-Scrabble players]. Van Hees says that this finding points to the brain’s flexibility, and suggests that we can use different areas of the brain to do similar tasks. The researchers are hopeful that their research can be used to help people with neurodegenerative disorders, such as Alzheimer’s. By using brain training exercises—Scrabble included—alternative parts of a person’s brain could conceivably be leveraged. More at the CBC. and read the entire study at Cortex: “Neural correlates of visual word recognition in competitive Scrabble players as measured during task and resting-state”.